According to the Epic of Gilgamesh, how can one escape the normal dismal fate of the dead and gain access to pure water in the afterlife? You should be ashamed of yourself. You are going to make me work. 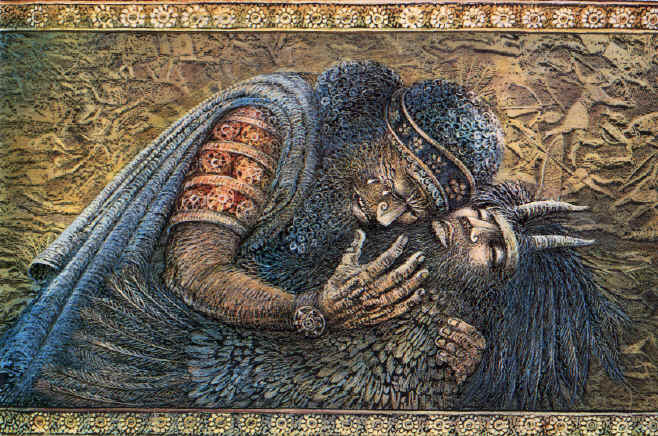 I thought I knew a lot about the "Epic of Gilgamesh" but now realize that although I have read a lot about it, I never read it. Now I'm going to have to read it to see if I can answer your question. PS Does Readers Digest have a condensed version? HAHA! Excellent! You do indeed have your work cut out for you! Let me know if you need any hints - you know, like which rescension, which tablet, etc.... hee hee hee! Don't worry - the search is well worth the effort, as usual. If this is your first time reading it - you are in for a treat! Take your time, though - don't spoil it with your Reader's Digest version ha ha! The act of reading it is as much of a journey as the one Gilgamesh takes, in my humble opinion. I don't know anyone who has sat down with this work, worked their way through it, and not come away amazed at what they (and most of the world for thousands of years) have been missing. The plant granted one's youth back (so the next best thing to eternal life, right? ), and appears to clash with the central theme of the work: man's fate is mortality, and only one man was granted eternal life - it's possible it was added, or from another tradition, and became popular enough to remain. Perhaps it was an alternate version of the reply that is given after the Flood narrative? Come on now - nobody has gotten the answer yet? I'd be interested to hear from anyone who has taken up the challenge and reread the work, or read it for the first time - just to hear their thoughts on it, as well! I believe the story of the Great King..and his kingdom was based on a plant at the center of the Garden..(very simular to God's Eden)...if the plant was there, and left to do what it did or does naturally...(Climatize the area, filtered the air, water , and soils, also transpired the water from the ground to the air so it would rain, connected to the sun and bought power to the Earth, storing heat....it also kept out evil when sown sinlessly = Holy ground..) as long as they left it alone....I believe that is the knowledge of the King ...His enemie Inkidu was a wild man of the forest, from a wild land..and they fought and fought..because Inkidu was so brave,and so strong, and such a fine warrior the King grew to love him in battle..more then hate him...when Inkidu vanished...Gilgahmesh went to find him in the mountains of spirit...and while he was seeking his friend...the kingdom was laid waste...the plant no one knew how to use right...was abused, defiled, profaned, twisted to idols, and bent ...evil came onto the lands...God's anger grew over them...they did not put it back the right way ever...and the story continues throughout time...a story of everlasting perportions...the plant is still here, the wild man inkidu has showed his face as a indian native..and the King looking for his friend throughtout time...one day these three things will come together as one...and the kingdom will come again of peace, health, and happiness...of course we all have to do our part to keep the story alive, and come to an epic end....as the king has made his will known..his judgements..his laws..his covenants...if we follow them...we become sinless enough to put it back where it belongs...tame the wild...and make peace with all living things....Yep..that is the story....and it goes to war with God tragically at first...but then it gets better...and then it is wonderful...forever after. I know someone will emerge victorious in this battle for the secret of pure water! Another hint: a couch may be involved. A couch.